Sponsored by the SHSU public relations firm Priority One, the event will be held from 6-8 p.m. in Dan Rather Building Room 125. Lawson’s career with Channel 13 has taken her all over the world and has earned her numerous awards for her reporting, including an Emmy Award for her coverage of President Bill Clinton's visit to South Africa as the only local reporter in the nation to make that trip. She covers city, state and national elections and has interviewed a wide range of notables, including three U.S. Presidents, Henry Kissinger, the Dalai Lama, poet Maya Angelou, Grammy Award winner Destiny's Child, former heavyweight champion boxer George Foreman, director Spike Lee, legendary journalist Barbara Walters, evangelists Joel and Victoria Osteen, and actors Lily Tomlin, Shirley McLaine and Denzel Washington. She began her career with Channel 13 as a general assignments reporter before being promoted to co-anchor of Live at 5 and Eyewitness News at 11 a.m. She also hosts a weekly Community Affairs program called "Crossroads," focusing on issues and events around the city. Refreshments will be served during the free event, which is open to the public. A question-and-answer segment will be allotted at the end of Lawson’s discussion. Under the direction of Warner Endowed Chair of journalism and former White House spokesperson Peter Roussel, the on-campus Priority One team is staffed by students who seek a career in public relations. The group provides on-campus departments, organizations and others with public relations services. Their Kat’s Meow series has included notable media personalities David Strickland, of Channel 13, and Lana Hughes, of KTRH Radio. For more information about Priority One events or services e-mail priority1pr@gmail.com. SHSU will kick off the holiday season on campus with a 38-foot tree during the 90th annual Tree of Light Ceremony on Wednesday (Dec. 1). The festivities, which will begin at 6 p.m. in Bearkat Plaza, will include remarks by university president Dana Gibson, performances by the Orange Pride dance team and university choir, and holiday snacks. In addition, 99.7 FM K-Star Country will broadcast live from the event. To share the holiday spirit with those in need, the Student Activities Department will collect canned goods during the event for a drive that will benefit an area organization. Student Activities will also feature the history of the event during an exhibit in the Lowman Student Center Art Gallery Monday (Nov. 29) through Friday (Dec. 3). "The Tree of Light is the university's oldest and most cherished tradition," said Student Activities associate director Angie Taylor. "This tree-lighting ceremony is also a time of giving and reminds students and the university community what the holiday season is all about." The Sam Houston Memorial Museum will step back in time to explore the holiday season as Gen. Sam Houston did on Saturday (Dec. 4). “A Houston Family Christmas,” a full day of activities for all members of the family, will be from 10 a.m. to 2 p.m. on the Sam Houston Memorial Museum Grounds. The day will include photos with Santa; punch and cookies; and tours of the Houstons’ Woodland Home and other historic houses. “The purpose of the Houston Family Christmas is to welcome the Huntsville Community to the museum, to step back in time to the 19th century, and enjoy the holidays of a simpler time,” said Megan Buro, museum marketing coordinator. In taking a step back, the museum will showcase the difference between modern decorations and how the Houstons would have decorated in the 1840s when they lived in Huntsville. “Decorating is not what we think of today, and there were no Christmas trees,” Buro said. “Decorations were simple and came from the land, so the Woodland home is decorated to that time period, simplicity, using evergreens and hollies from our grounds. “The Steamboat house does not get decorated because it is a house of mourning, since that is where Sam passed away,” she said. In addition, spinning and weaving, blacksmithing, kick wheel pottery, woodworking, and Cherokee Indian customs demonstrations will be held throughout the event. Also that day, approximately 30 vendors selling arts and crafts will be set up in the Walker Education Center from 10 a.m. to 4 p.m. for the annual CWA Angel Show. “The items are unique, handmade pieces made by talented artisans from the Huntsville area,” Buro said. SHSU singers will feature scenes from Italian operas from the 1600s to present during the Opera Workshop production Friday and Saturday (Dec. 3-4). “Viva Italia” will be presented at 7:30 p.m. in the Performing Arts Center Recital Hall. “The worship will highlight the beauty of Italy through scenes from its most beloved operas,” said Rebecca Renfro Grimes, director of the SHSU Opera Workshop. The production includes stage direction by Grimes, music direction by Robert Hunt, lighting design by Carolyn Barton and set design by Jeffrey Lindquist. Admission is $15 for general admission and $12 for students and senior citizens. Tickets can be purchased through the Performing Arts Center Box Office at 936.294.2339 or tickets@shsu.edu. The Sam Houston Memorial Museum will get patrons into the Christmas spirit with a free movie night showing of “Christmas Vacation” on Friday (Dec. 3). "Christmas Vacation," starring Chevy Chase, will begin at 7 p.m. at the Katy and E. Don Walker, Sr., Education Center Auditorium. The 1989 National Lampoon movie centers on Clark Griswold, who is determined to create the perfect holiday celebration, but things begin to go haywire when his family arrives. The movie also stars Beverly D’Angelo, Juliette Lewis, Johnny Galecki, Doris Roberts and Randy Quaid. Popcorn and drinks will be sold at the museum store. Admission free but is limited to the first 150 patrons, the auditorium’s capacity. 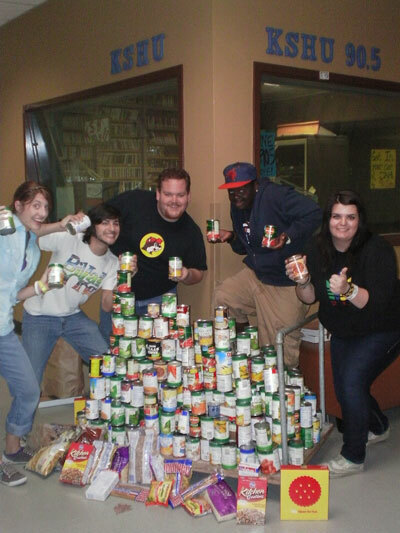 SHSU’s radio station 90.5 "The Kat" KSHU recently collected more than 350 pounds of food and $300 in cash donations for Huntsville’s Good Shepherd Mission. Radio station disc jockeys asked for food or cash donations during a two-day drive through a live remote outside of Kroger. The 35 student participants collected the items over the course of two-hour broadcasts each day on Nov. 9 and Nov. 10. “KSHU is a part of the Huntsville community, and we wanted to give back,” said LeeAn Muns, broadcast operations director. “We just wanted to do everything we could to help make the holiday season a little brighter for all families. "This was important not only to the volunteer DJs but also to staff,” she said. This is the second consecutive year that the radio station has held a drive for the Good Shepherd Mission. Li-Jen Shannon and her students, who refurbish donated computers from SHSU, recently delivered two CPUs and repaired a few problems currently in Samuel Houston Elementary's lab. SHE is the only elementary school in Huntsville to have two computer labs utilized by its teachers. Because of the partnership with SHSU, SHE students get to use computers more often during a school week. 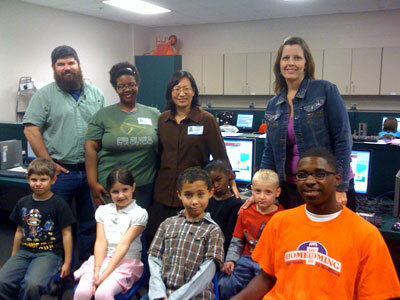 In 2003 assistant professor of computer science Li-Jen Shannon began a program in which students in SHSU’s computer science department would refurbish discarded university equipment and donate them to rural school districts. School districts in Shepherd, Livingston, Big Sandy and Livingston, as well as Hull-Daisetta High School, have benefitted from the program, many of which used the computers to establish labs for their students. “As technology evolves in a fast speed, we all knew that the multimedia lab SHE established in 2008 would need attention to be upgraded soon,” Shannon said. “Therefore, we decided we would like to follow up and support them to make sure that the children can always enjoy the most updated technology in their school. The program is mutually beneficial for both SHSU students, who gain computer repair experience, and HISD, with whom SHSU has established “a great partnership in supporting their needs,” Shannon said. “The communication we had with the technology director from HISD was to extend the students' service in a wider areas, from hardware to the network services,” she said. “Since the HISD technology department is taking care of eight schools, it was great to let our students reach out, share their load, and assist their tasks. The “follow-up” service is only offered locally because of travel and safety issues of the students who volunteer for the program. Sam Houston State University reported the utilization of more Historically Underutilized Businesses than any other schools in the Texas State University System, according to the State of Texas Comptroller’s recently-published 2010 Annual HUB Report. According to the report 25.8 percent of SHSU’s expenditures went to HUBS, almost 10 percent higher than the state average of 15.9 percent, for the fiscal year from Sept. 1, 2009, to Aug. 31, 2010. “The report shows how state agencies and universities fared in the administration of their respective HUB Programs,” said Bob Chapa, HUB coordinator. “HUBs are minority and women-owned businesses that have been certified through the Comptroller’s office. The State of Texas Comptroller published the 2010 Annual HUB Report on Oct. 15. The university was also successful this past year in setting up three mentor/protégé relationships, bringing the total to four, according to Chapa. These include WWW Grainger/The Burgoon Company; J. T. Vaughn Construction/McCaffety Electric Company; Steelcase, Inc./HBI Office Solutions, Inc.; and Office Depot/PDME-Hurricane Office Supplies. “The efforts by all our university departments in obtaining 25.8 percent are greatly appreciated and continued support to HUBs is encouraged,” Chapa said. For more information about the university’s HUB Program, contact Chapa at 936.294.4670 or rlc001@shsu.edu.